WASHINGTON — President Trump’s ability to get his revised North American Free Trade Agreement through Congress may hinge on a little-noticed provision governing intellectual property protections for new pharmaceutical products. Congressional Democrats have seized on measures in the United States-Mexico-Canada Agreement that establish protections for drug companies, saying they are a boon to the pharmaceutical industry and could undermine efforts to make American health care more affordable. The issue is the latest complication in Mr. Trump’s yearslong effort to rip up Nafta and rewrite the rules of trade with Canada and Mexico. 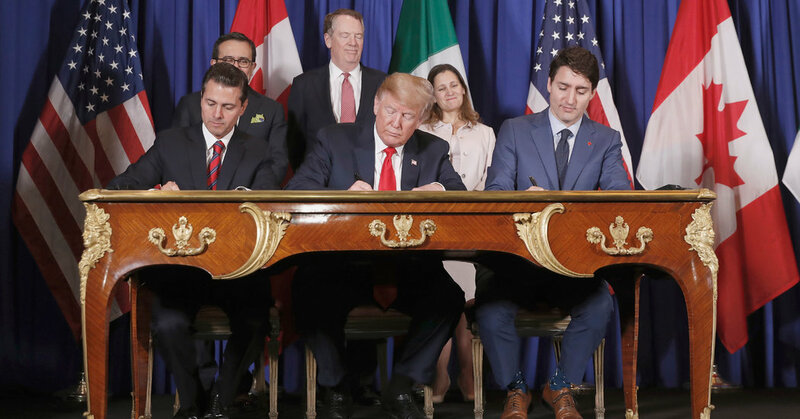 While Mr. Trump secured Canada’s and Mexico’s signoff on the new agreement last year, the trade pact must be ratified by legislators in all three countries, including by Congress. Democrats, who now control the House, have already made it clear that they will not approve the new trade deal without significant changes to labor and environmental provisions. Now, they are also looking for revisions to the trade deal’s pharmaceutical provisions, in particular a measure providing 10 years of protection for the data that drug companies use to obtain approvals for an advanced class of drugs called biologics. Biologic drugs are made from living organisms rather than synthetic chemicals and have been used to treat diseases including diabetes, multiple sclerosis, rheumatoid arthritis and cancer. Obtaining approvals for these drugs requires clinical trials and other research and development, which are both costly and time consuming. The new trade pact gives biologic drugmakers 10 years to keep their data to themselves. After a decade has elapsed, competing drug companies are allowed to rely on the original company’s data to get product approvals, without repeating clinical trials, as long as they can show they have produced a similar drug. That 10-year provision would raise the timeline in Canada, where the industry currently has eight years of protection, and in Mexico, where it technically has none. It would not change current policy in the United States, where the standard is already 12 years. But Democrats are objecting to the provision, saying that enshrining the time period in a trade agreement could thwart their future efforts to lower health care costs through legislative changes. Lawmakers also argue that other provisions of the trade pact could hinder development of generic drugs. Democrats, who say they gained control of the House with a mandate to address spiraling health care costs, are seizing on the pharmaceutical provisions as a way to make an impact on the trade deal and potentially separate the president from his populist base. “The American public is fed up with what’s going on with drug pricing,” said Representative Earl Blumenauer, the Oregon Democrat who is the chairman of the House Trade Subcommittee, which is responsible for overseeing the president’s trade agenda. Mr. Blumenauer said he and other members of the subcommittee were not likely to support the deal in its current form. “I personally have no interest in our driving something through that is intensely contentious and partisan,” he said. The provision’s supporters, including those in the pharmaceutical industry, say that Democratic opposition is misguided and that these are basic intellectual property protections that are necessary to protect American innovation and give companies an incentive to invest in developing drugs. “We need to make sure we’re protecting American companies that are engaging in research and development that will give us these lifesaving treatments,” said Gary Locke, a former Obama administration official and the head of the Pass USMCA Coalition, a group of trade associations and businesses. “If Mexican and Canadian firms are able to outright copy this stuff, what incentive is there for U.S. firms to engage in this research that often doesn’t even pan out?” Mr. Locke asked. The clash underscores the pharmaceutical industry’s unique position as both hero and villain. While the industry is often hailed as an engine of American innovation, it is also viewed as a primary driver of rising health care costs through high prescription drug prices. A similar conflict over drug industry protections helped delay and ultimately sink the prospects for another trade deal, the Trans-Pacific Partnership, which was negotiated by President Barack Obama. The deal never won sufficient support in Congress during the Obama administration, and Mr. Trump pulled the United States out of the pact during his first week in office. The United States has led the world in the development of new pharmaceuticals, particularly biologics. This advanced class of medicines, spurred by the completion of the human genome and other biotechnological research, has delivered groundbreaking treatments for debilitating diseases. But some of the drugs can cost hundreds of thousands of dollars per patient per year. Biologics are a small share of prescription drugs taken today, but they make up a rapidly expanding share of medical spending in the United States. Generic versions of these drugs, called biosimilars because biological drugs often cannot be reproduced identically, are mostly still in their infancy. Advocates for patients and the generics industry say provisions in the new trade deal would further restrain that development — and preclude cheaper drug prices — by protecting the regulatory data that drug companies use to get approvals for new biologics. “The objective is to tie the hands of members of Congress so that they cannot reduce the long exclusivity period for the most expensive drugs since they would be infringing the terms of the trade agreement,” said M. Fabiana Jorge, president of MFJ International, an advocate for patients and the generics industry. But the pharmaceutical industry says the United States needs to provide protections to encourage further research and development of these cutting-edge drugs. “At a time when markets like China are proposing to raise their standard to 12 years, North America must also have strong intellectual property protections that balance innovation and competition,” said Stephen J. Ubl, the president of the Pharmaceutical Research and Manufacturers of America, the industry’s largest lobbying group. The Trump administration, which negotiated the 10-year provision, has largely rejected the Democrats’ objections and says the measures will have no effect on the American drug industry given the existing 12-year limit. “The provisions will have no impact on current U.S. law in this area, and should not have any impact on Congress’s ability to act in the future,” said Emily Davis, a spokeswoman for the United States trade representative. The generics industry says these protections could restrict exports of biosimilars, undermining the industry as a whole and therefore the mission of making drugs more affordable. Given that the Trump administration has said the new pact will serve as a model for other trade deals, the industry is also concerned that these provisions could someday be expanded around the globe. Jonathan Kimball, vice president for trade and international affairs at the Association for Accessible Medicines, which represents the generics industry, said the deal’s drug provisions would strengthen the ability of pharmaceutical companies to extend their current monopolies. “That goes against the entire public debate we are having now about reducing drug prices,” Mr. Kimball said. The agreement has several provisions that should appeal to Democrats, including measures intended to encourage automakers to pay higher wages so that their cars qualify for zero tariffs and limits on a special dispute settlement system that allowed corporations to sue governments. But Speaker Nancy Pelosi, Democrat of California, has signaled that she will not pass the deal without strict enforcement. The deal’s passage seems more certain in the Senate, which is still controlled by Republicans. Mr. Trump’s trade adviser, Mr. Lighthizer, has worked closely with Democrats and unions to craft a deal that the administration hopes will receive broad bipartisan support. But the Democratic Party has yet to settle on a consensus position about the changes that would be required to win their votes. Several aides to senior House Democrats described passing the tweaked trade bill as a relatively low priority — unless Mr. Trump officially pulls the United States out of Nafta, which could require Congress to act. There are a number of ways the administration could make changes to the already-negotiated trade deal, but the most rigorous would require reopening negotiations with Canada and Mexico, something the Trump administration has said it will not do. Last week, Mr. Lighthizer fielded questions from House lawmakers, who mainly pressed him on labor and pharmaceutical issues. February 15, 2018 Comments Off on A Boston Dynamic Robot Has Figured Out Door Levers. Sleep Tight!